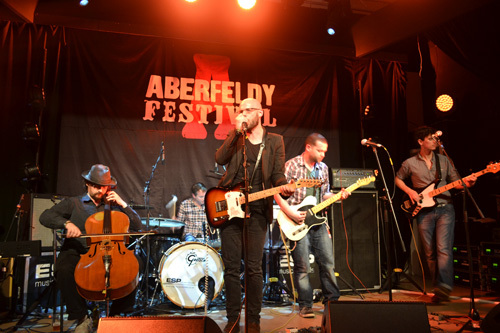 A chilly Aberfeldy once again welcomed the masses with open arms for the fourth instalment of Aberfeldy Festival. Extended to three days this year, the festival continues to grow, whilst maintaining the spirit of a friendly village event. With the repeat sponsorship of local whisky makers Dewars on hand to provide some cracking free cocktails, visitors and performers are never short of a dram. The town hall was again the focus for the evenings live music but this year there were also events such as live poetry readings and music in the newly refurbished art-deco Birks Cinema and an appearance from Aidan Moffat in the Dewars Distillery. The live music in the town square was unfortunately a bit of a wash out due to some nasty downpours on the Saturday afternoon but despite the weather performers like Rick Redbeard were able to laugh about it later that evening. When we hit the town hall on the Friday evening Conquering Animal Sound were already in full swing. 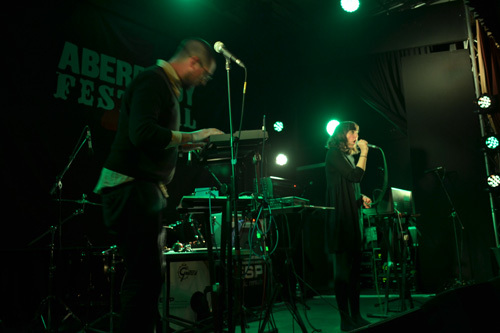 Singer Anneke Kampman was making use of her vantage point on the stage, coming to the edge to deliver her vocals. Her Bjork-esque phrasings combined with electronics and live looped percussive additions give them a sound which has hints of Múm and made for an interesting live set. Randolph’s Leap team of eight had the crowd shimmying along, coming in with a sound not disimilar to Belle and Sebastian and featuring everything from fiddle to brass their indie-pop was the perfect remedy to the cold outdoors and helped raise the temperature indoors too. 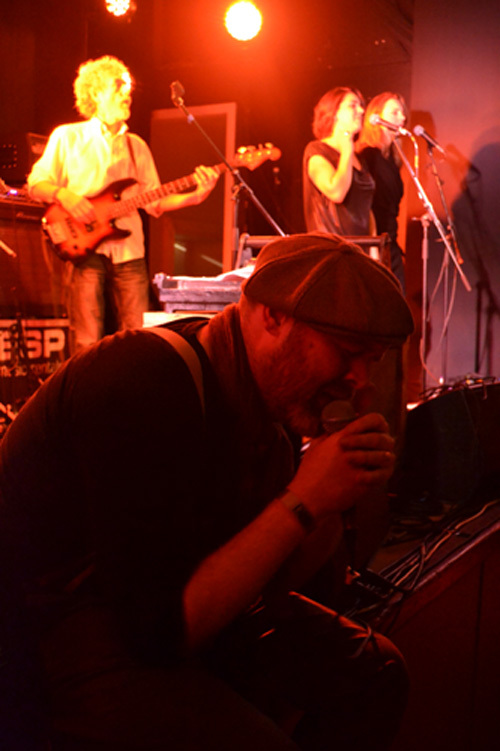 Aberfeldy Festival founder Ryan Hannigan led his group Starwheel Press for their Friday headline slot. Hannigans dry delivery, over their beautiful folksy americana tracks even featured some live printing – Hannigan is an artist and runs a traditional print shop/ gallery in the town – as well as a megaphone and some guest vocals and dancing from some of the local natives all provided a warming end to the first night’s live music. 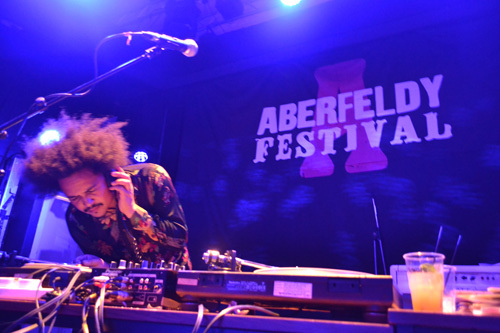 Steven Marshall took the festival into the wee hours with a DJ set. Withered Hand took to the stage and immediately kicked things up a notch. Sounding good with a new band around him (including Pam Berry on backing vocals) as well as a stream of new material, there seemed to be more of a snarl than usual to his delivery tonight. New material is due sometime next year and if these tracks are an indication then it should be another corker of an album. Meursault followed with an intense perfromance as ever. Dropping from high volume and energy distortion to muted and tender comes naturally to these guys. They had the right mix of personal musicianship, as well as some great sound desk mixing and PA (common throughout the weekend it should be noted) on their side and they made the most of it. 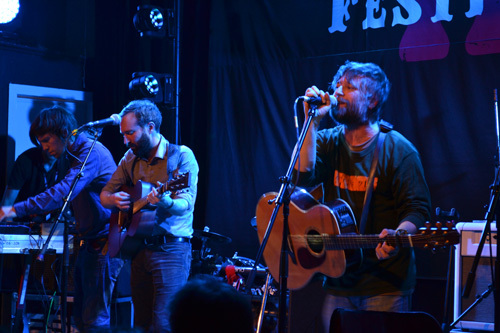 Rounding off the live music for the Saturday were King Creosote and Lomond Campbell who played a mixture of each of their own material as well as some collaborative tracks. Set highlight would probably be awarded to closing track The Happy Song, a cover of KC’s brother Gordon’s band The Aliens. This had the crowd screaming back the chorus whilst hands were thrown in the air with absolute glee. DJ until close was one Joel Stones from NY record store Tropicalia In Furs. This man knows his 45’s and the set he played was nothing short of mind-blowing. From rare Brazilian psychedelic nuggets lost in history to classics like Tutti Frutti he left no room for breath between tracks as the town hall danced the night away. 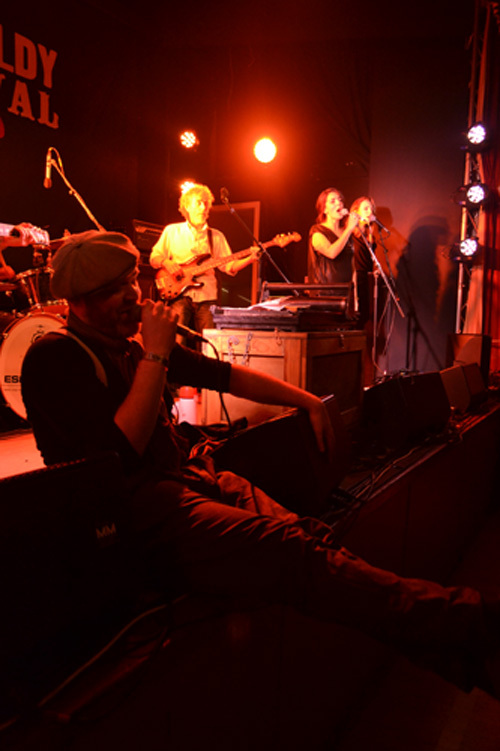 Sunday saw acts such as Stanley Odd and Teen Canteen open the evening, and a performance from unbilled irish raconteur Lisa O’Neill whose tales and songs brought laughter and sadness in equal measures was thoroughly enjoyed. No doubt about it though the evenings high point was the mesmerising set from James Yorkston, Jon Thorne and Suhail Yusuf Khan collectively known as The Dewarists and featuring The Cairns String Quartet. Multi instrumentation from all members, along with shared vocal duties meant for a quality, varied set drawing on various genres from around the world. Saint Motel visiting from LA had definitely made plenty new friends over the weekend and closed the festival with a fun party vibe. Covering subjects as serious as suicide and light hearted as flirting they somehow made all of it danceable. The combination of local and visiting talent make this a special festival, and having it in November when the town is less busy and the landscape is beautifully colourful is a stroke of genius – long may it continue, even if the weather is something of a gamble.